This is my review of top business invoicing software FreshBooks. FreshBooks is secure, online software with powerful but simple billing features that can be used world-wide. It was developed over 10 years ago by a businessman looking for a smarter way to invoice customers after he accidentally wrote-over a customer invoice in his spread sheeting software. FreshBooks is recommended by 97% of small business owners. The current FreshBooks software was unveiled towards the end of 2016 to be a fresh, simple and faster product compared to their Classic version. FreshBooks is perfect for helping you with customer billing and sales invoice tracking, after all this is where your potential income and survival is at! This feature makes it ridiculously easy for you to prepare sales invoices and stay on top of customer payments, and free up your time to do what you need and love to do. Also, customer payments do not automatically import to FreshBooks. You must check your bank account and manually apply the payments received against the sales invoices in FreshBooks. *Important Update: March 2019 - FreshBooks announced that they are now introducing these double-entry features: the cost of goods sold; a general ledger, balance sheet, and chart of accounts; "other income" received outside of invoices from FreshBooks, a trial balance to help users find errors, bank reconciliation and accountant access. Read more about it here. **In Jan 2018 I asked FreshBooks about bank reconciliations and they advised me that they have had a lot of requests for this feature to be included, so it is on their radar. However, they have no time frame yet as to when it will be done. Their goal was to keep it simple and deliver it as single entry software. who want quick access to expense reports. It can be used by small business owners world-wide because there is a sales tax feature. who is freshBooks NOT For? 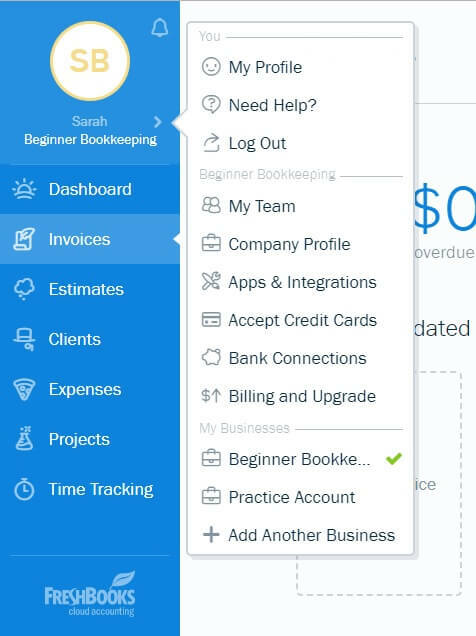 Update March 2019: With the new double-entry additions being introduced by FreshBooks this software will be great for most small businesses except for Accounts Payable (tracking unpaid bills) and in-depth inventory records. US$25 per month on the Plus plan (the most popular plan) – lets you bill up to 50 clients and to send proposals and includes all Lite features. US$50 per month on the Premium plan – bill up to 500 clients - includes all features from Lite and Plus plans. Prices include world-class support, a knowledge data base and the ability to call FreshBooks direct. You can include sales tax on all expense and income transactions. You can view a nifty sales tax summary report that displays the tax information you need to complete your sales tax return to your government. One negative point I see is that sales tax is not calculated automatically by FreshBooks. The sales tax on every expense or income transaction has to be manually calculated by you with a calculator and then entered against the transactions. Email to your clients estimates or proposals of work, listing the services you will provide and their cost. 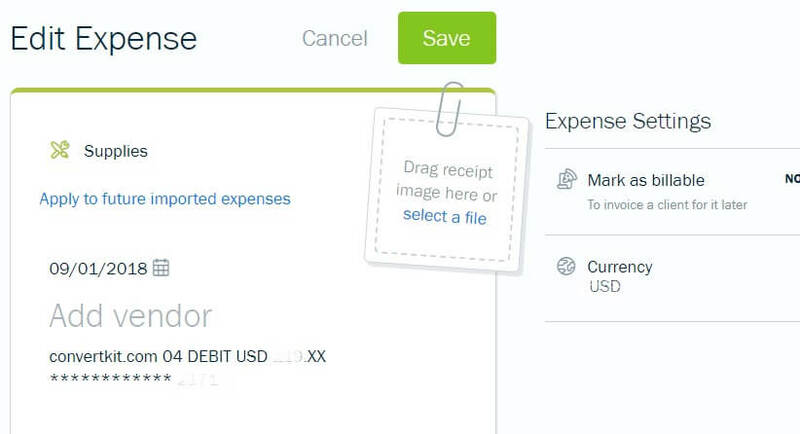 Connect your bank accounts to FreshBooks business invoicing software to automatically import all expenses. Note: this does not give FreshBooks access to your bank account to make payments or transfer money – all it can do is import expense transactions from the bank statement. The monthly subscription price of FreshBooks is a deductible business expense. There is an option within each expense transaction to add an image of the receipt. Snap a photo of it with your phone or scan it in to your computer, and then drag or find the image file to add. If it is a PDF it will display the PDF logo or if it is a shop receipt it will display that. It is easy to delete if you find you have attached the wrong image. Maintain a database of client details which includes contact information and the current balance owed to you by them. Easily track how much your clients owe you so you can start chasing in the over-due payments. The reports make it easy for you to see at a glance who still owes you money. The App integration (more on this below) means you can use something like CollBox to automatically identify overdue payments and pair that debt with the best collection agency – all you must do is approve them – and then get on with your customer service while they collect your money. Give access to your contractors to collaborate on projects and send you invoices. Get a quick idea of all customer payments that have been collected. Check out all the Apps available here. 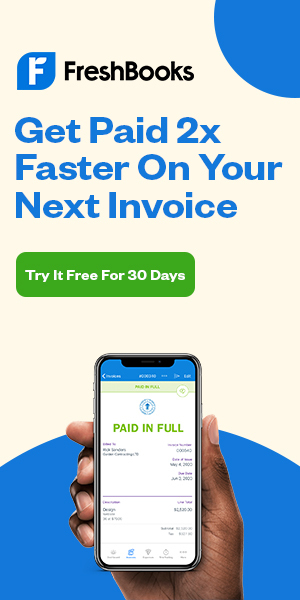 If you run more than one business, you can connect them to the one Login for easy access, but you will pay a separate fee to FreshBooks business invoicing software for each business. Wages information can be automatically imported and assigned to an expense categorization using an App integration (like Gusto) so that you have all your expenses in the right place on the Profit and Loss report. You can email or phone FreshBooks business invoicing software with your questions, and from my experience they are very fast to reply. There is a handy little blue circle on every page within FreshBooks providing a fast link to enter a keyword relating to your question to search their database, or you can go to the ‘Need Help’ link on the menu options for other help options like email or phone support. You cannot automatically import customer payments received in to your bank account. 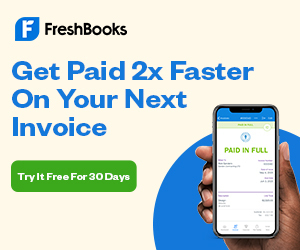 You must enter these manually against the sales invoices in FreshBooks (check your bank and update FreshBooks business invoicing software every morning – especially if you use Collbox). You cannot download the software to your computer – it is a Saas system (online Software as a Service available over the internet) on which you pay a monthly subscription fee. Do not rely on the profit and loss report inside FreshBooks to be the final result for tax purposes – I explain more on this further below. I love the quick view expense report which groups them into their assigned categories and gives you a total of each. Not being able to access a balance sheet As of March 2019 Balance Sheet is being introduced. Not being able to reconcile the cash book As of March 2019 the ability to reconcile the bank is being introduced. Whilst the Profit and Loss report in FreshBooks business invoicing software can help you see if your money is in the black i.e. bringing enough income in to cover all the expenses you pay for out of the bank and leave you with a profit, there will sometimes be expenses that should not be on a P&L but should be on a Balance Sheet. The above-mentioned expenses are not tax deductible. Tax is calculated on the final profit, which is calculated within the P&L. Leaving these expenses on the P&L decreases your profit meaning you pay less tax, but if it is ever found out that you have included non-deductible expenses you will suffer penalties by the government. Moving these expenses to the Balance Sheet* avoids this problem. Update: As of March 2019 FreshBooks are introducing a Balance Sheet so you will be able to use this to track non P&L type expenses. So, take care when filing your tax return not to include these non-deductible expenses. Use a professional bookkeeper or accountant to help you get this right for tax time so you can relax and get on with what you need to do. 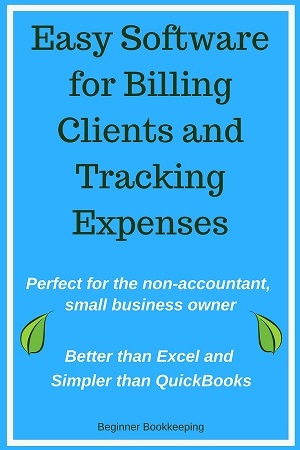 If you do not use a bookkeeper or accountant, I highly recommend getting other software that enables you to track deductible and non-deductible expenses in the appropriate reports on a monthly basis, and use the P&L from that other software for filing taxes at the end of the year. You can even use an Excel spreadsheet like our Accounting Excel Template. As I mentioned earlier, you do not have access to the cashbook in FreshBooks business invoicing software. You can either keep a cashbook yourself using other software which enables you to process a bank reconciliation (even a spreadsheet or cash book that you write in), or pay a professional bookkeeper to do it. This is important because un-matching balances mean that income or expense transactions are missing. This affects the P&L in a negative way. Even though FreshBooks automatically imports the expenses from your bank account, all software can experience glitches and there may be times when a transaction has not imported. A monthly bank reconciliation will uncover missing income or expenses. why is a bank reconciliation important? Wouldn’t it be awful if several months down the track you discover a missing billable expense transaction and now it’s too late to charge the customer and you’ve lost out on income? Or what about income that has not been included on the P&L and is not declared on your tax return thus meaning you pay less tax; you will pay penalties by the government for not declaring income and paying tax on it. With FreshBooks you won't spent abundant time learning accounting just to bill your clients or keep your eye on expenses. And you won't be stuck using Microsoft Word or Excel to produce and track invoices. As an experienced bookkeeper I had to re-think everything I am familiar with to be able to work within FreshBooks because of how different it is to the standard bookkeeping software programs available. I had to think like someone who has no experience with double-entry bookkeeping when using FreshBooks because it is a single entry program. Once I truly understood FreshBooks’ main goal I was much less frustrated. Their main goal is providing easy accounting software for billing clients and tracking expenses. This is good news if you are a non-accountant, small business owner because you can skip the complicated accounting.